Anand Aravindakshan: This super singer Winner Anand Aravindakshan is caught red handed via social Media . Let us see this news in detail. 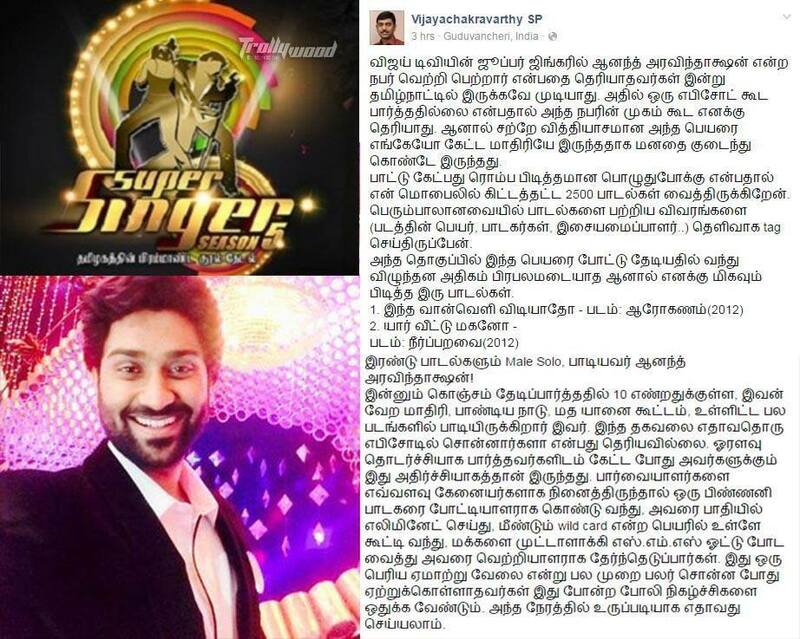 Super Singer is a popular show in Star Vijay TV and has a lot of Audience. The Final of the fifth season of this show was recently telecasted and the winner was declared as Anand Aravindaksha. Audience were asked to vote via SMS and Website. Audience were asked to vote via SMS and Website. Anand Aravindakshan was found to be playback singer already and has sang many songs in films like Arohonam, Neerparavai etc. But he has never mentioned about this during any of the episodes. This has created a buzz in the Social media and may has expressed their hatred to Vijay TV and stated that Vijay TV has done such thing for their cheap publicity !! Shame, Shame and Shame on Vijay TV. They did one blender, but now they try to cover up their mistake by some shameful programs. 1. Why each and every day you start, end and during breaks you people say that ‘”Thamizhagathin brammanda kural thedal”. It is not a search for the new voice. 2. Why you people in any one occasion also did not inform in front of Camera that Anand had sung these many songs in these movies. If you guys decently admit that a small mistake happened and will take care in future, your name will be saved. But you need to get back the first price money/ gift from that guy and share it to second and third runner ups. Dear people out there, We, as the audience, we were the one who has had cast the vote for Anand Aravindakshan when he was eliminated? When he was competing for the wild card round, with almost 9lakhs+ votes, we got him back, weren’t we? At the first point, if he is an established professional playback singer, he wouldn’t have been came into the reality singing competition, or did any successful playback singer? He got eliminated before he could even got into the top 4. We got him in. We loved him. We saw talent in him. Or it just happened by favouritism. But whatever it is, he did be the one of peoples choice. And that’s what even made him to win the title when the actual judges choice on the finale was for Raja Ganapathi with a total of 728 score (if I was not mistaken). Who made him won? We did. So when we were the one who made him won, why are we blaming the channel or the judges or him or the show itself for not ‘revealing’ the background of him as a playback? When we can spare our time to cast the votes for our favourite contestant online, why don’t we have the responsibility to spare a few minutes to google about them when the information available online as so clearly stated? When a hundreds of people can follow their favourite contestant on social media, why don’t we just go through their profiles to check who are they and what they stands for? Just like Anand Aravindakshan, he had all the previous post of him on Facebook sharing about the songs he had sang. Whose fault was that for not checking things out? Were we just waiting for someone to feed us with information all this while? Were we just blindly cast vote for him? Now my question is HOW IS IT AFFECTING PEOPLE OUT THERE AFTER KNOWING ANAND ARAVINDAKSHAN BEING A PLAYBACK SINGER, WHO HAD SUNG FEW SONGS AND WINNING THIS TITLE? WHERE WERE ALL THESE PEOPLE WHO SORTED OUT HE’S A PLAYBACK SINGER ALL THIS WHILE DURING THE COMPETITION WERE GOING ON FOR THE PAST 9 MONTHS LONG? WHERE DOES THE SUDDEN INTENTION CAME FROM TO FIND OUT HIS BACKGROUND AFTER HIS WINNING? ALL THESE SHOULD HAVE BEEN HAPPENING WAY EALIER, NOT NOW. WHAT WOULD WE(AUDIENCE) DID IF WE WOULD HAVE KNEW THIS EALIER?? WOULDN’T WE VOTED FOR HIM?? Guys come on, think about this!! Pls do correct me if I’m wrong. Anand is not to be blamed…. The talent search show is for amateurs, and if a professional is competing with them , then Vijay TV should have published it. They went wrong in cheating the audience into making them believe, that Anand too is an amateur…..
there are thousands of singers in chennai, what if you sing few songs, doesnt mean you are famous, sometime these tv shows offer more publicity, what rule has he broken? There is nothing wrong in him participating but they should have been open about it and not acted like super singer is the make or break for his singing career which was a blatant lie. I never expected this from vijay tv. If it is talent search show then what is the need for showcasing already searched and identified talent as a playback singer? Expect more. Expect the unexpected !!! I don’t know how much more this people is going to do and talk just to stain another person’s name. Anand Aravindakshan has sung a few songs and that is obvious on his fb page and YouTube which he himself has posted it out. Secondly, when Singer Manikka Vinayagam came as a guest in one of the round in the Super Singer competition, he has spoke it out during his comment that Anand Aravindakshan has sung a devotional song for him once before. With that, multiple times Singer Srinivas has told during his commenting that Anand Aravindakshan is an experience singer. So what is it to be shocking in this? Probably all this while many frogs were hiding inside the well, in which when now that they hopped out of the well they are very amazed with the real world. If Singer Anand Aravindakshan or Vijay Tv is to hide all this from the public, it will not be told or publicize it openly. If that is so, then Raja Ganapathy who is an ex-contestant in Junior Supersinger should not be allowed to participate in this round of competition for SuperSinger as he would have gotten much of stage experiences and knowledge of singing from his past participation. Does that sound fair then? To be truthful, such a singer named Anand Aravindakshan was not at all well known to many till now. He was struggling to climb up and when he turn his mind to strive for his best, what is it so difficult for you guys to encourage such a “never-say-die” attitude guy? Now that he has come openly to many eyes and in witness of many musicians and singers, he will be able to do much better than before in terms of grabbing opportunities to expand his skills. And the most bottom line, during the dedication round in Airtel Super Singer 5, Anand Aravindakshan has already openly told that he is in this competition is for his father. He wants to render his justice of competition to his dad. He wants to win it back for whatever recognition was not given to his dad’s hardwork. At least for this you guys can’t think that a son wants to render all he can for his dad? You can’t feel the rare responsibility and love that he has which is very difficult to find during this time of child-parents’ love? Probably there are a few who are still in shock with the result from the finals who have in turn resulted in trying all they can to “revenge” in terms of lamenting and criticizing as much as they can. Worst still, stealing a post from someone’s FB page without the user’s permission and posting it here in a hope of some extra publicity. Probably, Better luck next time. And note the point that the person belongs to this Fb page which you have shamelessly copied from has commented you to delete it off. This is happening in each and every season…. Ppl wr thinking why Sai Sharan won the title…. I guess Ilayaraja is not coming to this program because of all this politics going inside SS. check his FB page in 2013. You have been told?? By whom? Vijay TV? Listen to those songs, it is not hard to find out his voice. Also Anand Aravindakshan is not a common name for singers. he has already sung in Malayalam movie Annayum Rasoolum 2013..its even mentioned in his FB page..
Then he is not supposed to take part in Super Singer, since when someone is signed by a music director for play back singing, he is automatically removed from the Super Singer contest since they are a TALENT SEARCHING CONTEST, this is what they used to do so far but its seems since anand aravindakshan has sung a song with KS CHITHRA, it was ok for him to be part of the SS and win the title too!! she is such a cheap woman, eliminated jessica asking her to go to wild card round will selecting spoorthi has stopped singing in mid song (coz she forgot the lyrics), while eliminating another contestant ( a little boy not as influential as spoorthi) saying while performing he cant stop mid way and therefore she wont give him another chance,… truly disgusting that a woman behaves in such a way!!!! !